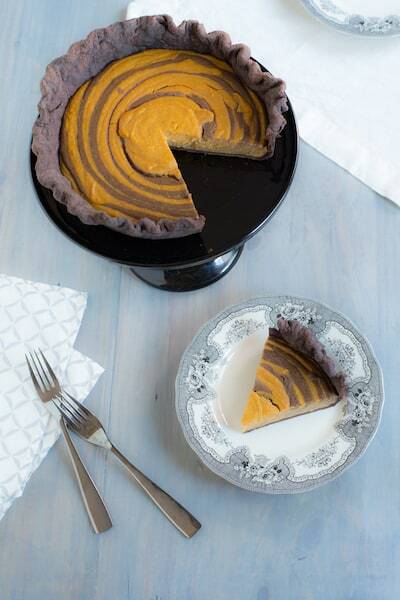 Butterscotch-Pumpkin Zebra Pie | Good. Food. Stories. If I may mix my metaphors for a moment, the World Series might be over and the Super Bowl months away, but the next few weeks are really playoff season for those of us who love to bake: a sweet but frantic time to go overboard making cookies, cakes, pies, and confections. 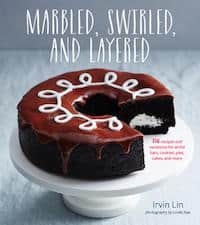 And while most of us fall back on a few beloved family recipes to stock our tins and trays, there’s a new cookbook to help you bring your A game for holiday baking: Marbled, Swirled, and Layered by Irvin Lin. If you’ve ever followed Irvin’s work on his own site, Eat the Love, you’ll already be aware of how visually stunning each of his creations are. And with more than 150 recipes and variations, Marbled, Swirled, and Layered offers an over-the-top dessert for any moment or craving. Feeling nostalgic? Irvin dreams up gorgeously whimsical versions of childhood treats like a roasted banana peanut butter cream pie to the cover recipe of an oversized Hostess cupcake. 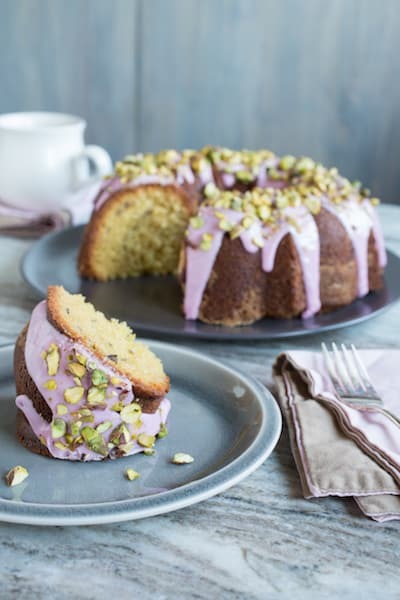 For a more vintage style of nostalgia, he takes on classic American recipes with charming names like the Lady Baltimore or Smith Island cakes, and beloved imports like the Eton mess and kouign amann. And as we come up on the hectic holiday baking season, this is a cookbook to keep in your back pocket for when you want to pull out all the stops. Irvin packs so much into the pages of the book, providing one or two alternative flavor combinations for each recipe. So with a few ingredient switch-outs, the traditional Thanksgiving pumpkin roll becomes the classic Christmas buche de noël. Malted chocolate chip and reverse chip cookies don’t seem festive enough? 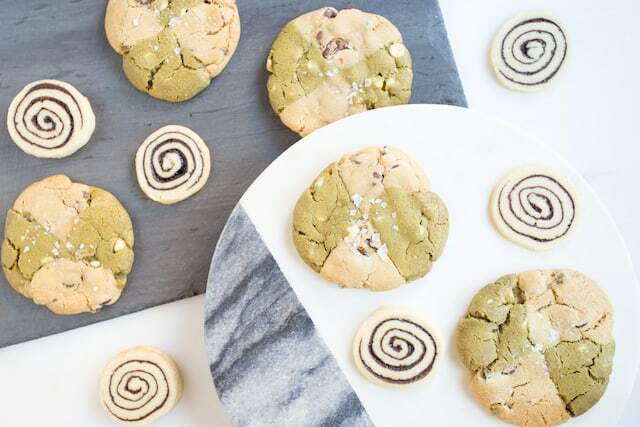 Use the alternative recipe for double chocolate chip and matcha green tea with white chip cookies, as I did below, for an impressive bake-off contribution with a pop of Christmas tree color. I always groan when I am confronted with the idea of making yet another pumpkin pie. I’ve been making them every year for Thanksgiving, with every possible twist. Caramel. Chocolate. Molasses. Orange. It all comes down to that darn ubiquitous cinnamon-heavy pumpkin spice. Everyone goes crazy over “pumpkin spice,” but I’ve always given it the side eye. Irvin has been kind enough to share the butterscotch-pumpkin zebra pie recipe from Marbled, Swirled, and Layered with Good. Food. Stories. readers, so read on to make this for your own holiday meal—and maybe start a new holiday dessert tradition. While Irvin learned to embrace the crazy, as he says, of pumpkin spice, I am a lifelong hater. So I changed the flavor profile of the pie slightly by replacing the 2 teaspoons pumpkin spice blend in the butterscotch filling with 1/2 teaspoon cinnamon, and by bumping up the quantity of cocoa powder in the chocolate filling to 2 teaspoons. I use Valrhona cocoa powder for intense flavor and a luxuriously dark look for all my chocolate baked goods; yes, it costs more than the usual grocery store brands, but it is truly worth it. I also made my chocolate pie crust in the food processor following my foolproof pie crust method instead of combining it by hand. Because that’s how I do. Combine the flour, cocoa powder, powdered sugar, and salt in a medium bowl. Stir vigorously with a whisk until the ingredients are evenly distributed. Cut the butter into 1/2-inch cubes and sprinkle over the dry ingredients. Using your fingers and hands, first toss the butter in the flour, then smash the butter into thin slivers, breaking them up as you go. Once they have been broken and flattened into small bits the size of peas, sprinkle the vodka and 4 tablespoons of the water over the butter and flour. Toss with a fork until the dough starts to come together. If the dough still isn’t forming, add the remaining 1 tablespoon water. Massage the mass with your hands until it forms a cohesive dough. Flatten into a disk about 1 inch thick, wrap tightly with plastic wrap, and refrigerate for at least 1 hour, or up to overnight. Roll out the dough into a 12-inch circle on a surface liberally sprinkled with flour. Fit into a 9-inch pie pan and prick the bottom of the dough with a fork. Line with a piece of parchment paper and fill with dried beans, uncooked rice, or pie weights. Bake for 15 minutes. Remove the paper with the pie weights, and bake the crust for an additional 10 minutes. Let cool on a wire rack while you make the filling. Combine the egg yolks, 1/4 cup (55 g) of the brown sugar, the cornstarch, and salt in a medium bowl. Stir with a whisk to form a paste. Heat the cream in a small saucepan until small bubbles start to form on the sides of the pan. Remove from the heat and cover to keep warm. Place the butter in a large saucepan and cook over medium-high heat until the butter melts and the milk solids start to brown. Add the remaining 1/2 cup (110 g) brown sugar and stir until the sugar starts to dissolve. Add the hot cream and stir until all the sugar is dissolved and the mixture starts to boil, with bubbles forming on the sides of the pan, 2 to 3 minutes. Turn off the heat. Drizzle about 1/2 cup of the hot cream mixture into the egg yolks while whisking. Repeat with another 1/2 cup of the hot cream, whisking constantly as you add the hot liquid. Add the hot egg yolk mixture back to the pan and turn the heat back on to medium-low. Stirring constantly with a heatproof spatula, cook the custard until it starts to thicken and coats the back of a spoon, holding a line when you draw a finger across the custard, 7 to 10 minutes. Stir in the vanilla. Pour half the custard through a fine-mesh strainer into a bowl (about 330 g) and stir in the cocoa powder. Pour the remaining custard through the strainer into a different bowl and stir in the pumpkin puree and pumpkin spice blend. Place the cooled pie crust on a rimmed baking sheet. Spoon about 2 tablespoons of the pumpkin custard into the middle of the crust. Spoon about 2 tablespoons of the butterscotch custard on top of the pumpkin custard. Repeat, alternating between the two custards, occasionally tapping the bottom of the pie crust on the counter gently to spread the custard out. Once all the custard is added, bake until the center of the pie just barely jiggles, 25 to 30 minutes. Let cool for at least 2 hours to set the custard. Serve right away, or refrigerate overnight. Bring to room temperature before serving.